Below is a current listing of our services and prices for the only combination Hand/Automated Wash System in Rockland County. Note that all services include blower and towel drying! Our Rain Arch provides a superior rinse and under carriage wash along with spray wax and triple foam wax options. Our state-of-the-art blowers are a pre-dry system that harmlessly dries most of the vehicle. We then finish off the complete drying process with hand towel drying. There is no track system that could damage your vehicle or your wheels. 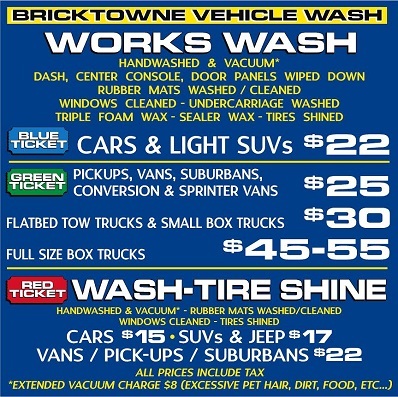 Soap is applied and your vehicle is washed by hand with special brushes and/or mitts. We use only European Natural Hogs Hair Brushes and large Soft Wash Mitts. We clean your wheels using only Cashmere Cloth Spoke Brushes! We never use any automated brushes or spinning devices that could scratch your vehicle. All of our hand cleaning gives you a superior result compared to a totally automatic car wash system.